‘game-changing’ industry for Florida’s Heartland. DeSoto Memorial Hospital is a major health-care employer in the region. Economic forecasters say that medical technology jobs will be one of the fastest-growing employment sectors in Florida’s Heartland over the next decade. rive down U.S. Highway 27 through the heart of South Central Florida and you will see a region that produces some of the sweetest sugar cane and citrus in the world. If business leaders and economic developers in Florida's Heartland have their way, the region will also become known as the sweet spot for global logistics, manufacturing and international trade. The focal point of this effort is the planned Americas Gateway Logistics Center, a mixed-use industrial park near Moore Haven that will connect manufacturing, distribution and transportation services operations in the center of southern Florida with some of the best ports and shipping routes in the Western Hemisphere. A development of Lykes Bros. Inc., A. Duda and Sons Inc. and Panattoni Development Company, the AGLC is a 6,700-acre site that is designed to become an international integrated logistics center with intermodal facilities that will connect to highways, railways, seaports and international air cargo airports. "Panattoni Development Company brings the expertise and client base as the international development and marketing partner," says Mark Morton, president of Americas Gateway Logistics Center LLC and senior vice president of Lykes Land Investments. Panattoni develops, leases and owns industrial, office and retail projects in more than 240 cities throughout the U.S., Canada and Europe. The company client list includes more than 500 companies, including 50 Fortune 500 firms. Panattoni has expanded relationships with tenants, brokers and investors across all sectors of the commercial real estate market. Since inception, the firm has completed in excess of 150 million sq. ft. of commercial projects worldwide. "Our goal is to get the North American manufacturing companies east of the Mississippi to locate here and export," says Morton. "The U.S. 27 Corridor has become a significant logistics route. It is a built-in freight corridor that connects Interstate 4 with Southeast Florida. AGLC is a great logistics play for the entire region south of the I-4 corridor." The ambitious plan includes space for 40 million square feet of buildings and includes a 2,000-acre tract for major assembly plants and aims to transform a 250,000-resident region that has been agriculture dependent for more than a century. If the plan succeeds, sugar, oranges and grapefruit will soon be joined by a plethora of manufactured goods on an export path to Latin America, Asia, South Africa and much of the U.S.
"About 250,000 people live within 45 miles of this site and are an excellent work-force pool," Morton notes. "A lot of small manufacturers and small distributors are located in this region, and we also have an emerging medical industry cluster. The potential is huge." Gina Reynolds, CEO of Florida's Heartland Regional Economic Development Initiative, agrees. "We are looking to be an export-driven region," she says. "The exciting thing is that this project is not in the conceptual phase anymore. Things are actually happening." For the FHREDI region — a largely rural area comprised of Hardee, DeSoto, Highlands, Okeechobee, Glades and Hendry counties in the center of southern Florida — projects like AGLC represent an opportunity for a young but eager work force experienced in agriculture, mining, health care and small manufacturing. 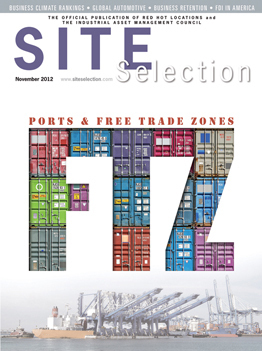 "Our location is primed to support a multitude of ports around FHREDI," says Reynolds. "You can be in a major city — Tampa, Orlando, Fort Myers, Naples, Miami, Fort Lauderdale, West Palm Beach and other locations — within two hours of this region. Our international access is tremendous through the ports on either coast of Florida. We are criss-crossed with U.S. highways and Class 1 railroads all under capacity." Upgrading the region's broadband infrastructure to support expanding manufacturers and distributors in all targeted industry clusters, along with the potential for call centers, is one of the focuses of FHREDI, says Reynolds. That effort now is centered on the Florida Rural Broadband Alliance LLC. FHREDI is a 50-percent owner of the FRBA, a $34-million project to construct and deploy a wireless broadband network. "This will impact every employment sector in the South Central region — agriculture, medical services, education and transportation," says Reynolds, who also serves as co-manager of the FRBA. "The construction of the broadband network is filling the digital divide between the urban and rural communities," she adds. "We are a group of rising communities that are aligning our regional resources to be the sweet spot for businesses that want to be connected globally." The linchpins of the region's infrastructure strategy are the AGLC and Airglades. The AGLC is located on a site that is expandable to 6,700 acres. The project is planned for more than 40 million sq. ft. of manufacturing, distribution, and other transportation/logistics and service-related facilities engaged in exporting from and importing to North America east of the Mississippi. The tract near Moore Haven lies in the center of a southern Florida market of 80 million permanent and seasonal residents and tourists throughout the year. AGLC has fives miles of existing rail frontage on the South Central Florida Express line, with connections to CSX and the Florida East Coast Railway. The site also has direct access to U.S. Highway 27 — a four-lane, divided highway — and State Road 78, both of which are popular inland truck routes. These roads connect to the Florida Turnpike and Interstates 4, 75 and 95. Four major seaports are located within a two-hour drive of AGLC: Port Miami, Port Everglades, Port of Palm Beach and Port Manatee. And three cargo airports are within a 90-mile radius: Miami International, Southwest Florida International and Airglades International airports. The planned Airglades International Cargo Airport, just 15 minutes away from Americas Gateway Logistics Center on U.S. 27, features an 11,000-foot runway and is one of only five FAA-designated airports in the country for international overflow. This air cargo center in Hendry County is a pivotal component of the region's logistics strategy. Gregg Gillman, president of the Hendry County Economic Development Council, calls the airport "a real game-changer for Florida's Heartland." With 70,000 acres of sugarcane fields and 70,000 acres of orange groves, Hendry County is one of the most agriculture-intensive jurisdictions in the nation. U.S. Sugar and orange juice maker Southern Gardens make their home in Hendry. "We have a huge agricultural base here, but we would like to diversify our economy," says Gillman. "Airglades International gives us the best opportunity to do that." The expansion of the airport will facilitate this strategy, notes Gillman. "We will have a new 12,000-foot runway in five years and will be able to handle any cargo plane," he says. "We will be able to accommodate any excess cargo coming into or out of Miami. We are only 100 miles to the north of the Miami Airport, and this expansion should bring up to 5,000 new jobs to Airglades Airport." Preparing that work force is the job of Roger Hood, president and CEO of the Heartland Workforce. One of 24 regional work-force boards in Florida, its mission is to work with business customers in DeSoto, Highlands and Hardee counties to enhance their productivity. Universal Space Network leased seven acres at Airglades International Airport to construct a global remote ground station to support commercial satellites. "We prepare the work force for the jobs needed by employers in our region. We work directly with our leading employers in Avon Park, Lake Placid, Sebring, Arcadia, Wauchula and other communities," Hood says. "We try to eliminate the skills gaps by identifying those skills most in demand by our largest industry clusters — agriculture, health care, education, and food and hospitality retail." Of all new job hires in 2011, says Hood, agriculture accounted for 61 percent of the jobs. "The next largest was the health care sector, which made up 11 percent of our new hires. Education was third with 7 percent." Hood says the region has great potential to become a leader in alternative energy production. "Bio-fuels and other alternative energy projects are one of the keys that we hold," he says. "We received a National Science Foundation grant for bio-fuels training and skills enhancement. Our targeted industries are bio-fuels, health care and lab sciences, and information technology. Also, logistics and distribution are a key sector for us, especially with the logistics center being developed in Moore Haven." Other emerging industry sectors in Florida's Heartland are food and beverage processing, manufacturing and aviation. A case in point is Universal Space Network, which leased seven acres in late 2011 at Airglades International Airport for constructing global remote ground stations — the firm's 16th telecommunications operation around the world. Founded in 1996 by Apollo astronaut Pete Conrad, the third man to walk on the moon, USN provides communications services to satellites in space. USN and its corporate partners operate the largest network of commercial satellite ground service. USN anticipates that the entire construction project in Hendry County will cost several million dollars. Gillman says that the project is significant because it shows that the area is ready for further expansion in aviation, aerospace, telecommunications and information technology. "Sometimes you just have to wait your turn, and I think it is now our turn," says Gillman. Hood agrees, noting that the broadband connectivity initiative "creates a level playing field for our communities. A distribution point in Okeechobee is already in place, and microwave radios are being placed on towers throughout the FHREDI region. There will be more broadband capacity in our region, and this will go a long way toward supporting information technology companies and health-care providers in Florida's Heartland." HenKay precast is a major employer in Hendry County and is representative of the emerging niche manufacturing sector in the region. The large-scale investment into infrastructure is already paying off, adds Hood. "We have had more project opportunities thrown our way because of this," he says. "The state has taken a vested interest in our strategic planning. As a result, interest from companies in locating and expanding here is increasing. We have been able to build spec buildings in Hardee County, and we still have plenty of available land. In fact, right now we are doing an inventory of land, building and infrastructure assets to make sure we have what we need to bring in the right kind of industry." Liz Albritten, executive director of the Immokalee Foundation, helps prepare the other asset needed by prospective employers — workers. But she works with a slightly younger demographic. "Our mission is to provide pathways to success for the children of Immokalee," she says. Located 40 miles east of Naples, Immokalee's population consists mainly of migrant farmworkers. "There is so much wealth on the west coast of Florida," says Albritten. "Travel just 40 miles east and there are companies that need workers. This creates an incredible opportunity for training our youth and adults for those jobs." Heartland Workforce in Sebring supports work-force training and development in Florida’s Heartland. The organization recently received a grant from NSF to provide bio-fuels jobs training. In addition, Gina Reynolds pointed out, "With efforts being made by FHREDI and economic development organizations in the region, there will be even more jobs created." For more than 100 years, the fertile soil of Florida's Heartland has attracted immigrants from all over Latin America. They come to harvest the many crops grown in the rich soil produced by the constant moisture of Lake Okeechobee, Lake Istokpoga, the Peace River, the Kissimmee River and South Florida's abundant sunshine and rainfall. For decades, the children of the region's farmworkers have grown up to become farmworkers themselves. Albritten dreams of giving them additional job options. "There are about 6,000 school-age children in Immokalee," she says. "How do you prepare these children to succeed in a global economy? Our goal is to help get these children through high school and on to successful careers, whether that is through college or technical education. We want them to become self-sufficient. And it begins with access to proper technology. That is why the rural broadband initiative is so important." The school district in Immokalee conducted a survey and found that only 20 to 25 percent of the community's residents were connected to the Internet at home. "There aren't even hot spots here," says Albritten. "The only hot spots in Immokalee are the library and McDonald's." About 24,000 people live in Immokalee. During the harvesting season, that population doubles, says Albritten. "The residents are 80 percent Latin American. They come to Immokalee mainly from Mexico, Honduras and Guatemala. About 18 percent are Haitian. About one percent are white and the remaining one percent are of other ethnicity." Work-force training will benefit from this infrastructure too, says Albritten. "Technology is integrated into everything we do," she adds. "We have partnered with the local technical school and Caterpillar Corp. to bring heavy-equipment training into that school. A new medical device manufacturing plant is being built in Ave Maria about 20 minutes from Immokalee. Thanks to this new partnership, our kids in Immokalee will have the opportunity to gain the skills they need to get a job at this plant." Reynolds sees the existing Latin American work force throughout the Heartland Region as a significant asset and opportunity, "We have a very good, hard-working, ready to be trained, Latin American-based work force to build from to help us become the global sweet spot for trade." One industry that finds a ready-to-work labor pool in the region is health care, says Tim Cook, president and CEO of Florida Hospital Heartland Medical Center. With a main campus in Sebring and satellite facilities in Lake Placid and Wauchula, Florida Hospital is the primary health-care provider in the Heartland. "When we look at this community, we work hard to provide a level of medical services that are a cut above what you might expect in a rural region," Cook says. "Two key factors are important. Number one, we have invested heavily in cardiology services. We now offer interventional cardiology. "Secondly, we are not just an independent, stand-alone place; we are connected to the Florida Hospital system around the state. We operate as a front door to any other Florida Hospital facility in Florida — including Orlando for heart transplants. If you come to one of our three medical centers in the region, you have access to any care that you may need at any other Florida Hospital in the state. That is a huge plus for the Heartland." With 1,300 workers, Florida Hospital is the second largest employer in Highlands County, and that work force is growing. "We have enlarged emergency bed capacity at the Sebring campus," says Cook. "We have 30 beds there now. There are another 10 to 12 beds in Lake Placid and 14 in Wauchula." Florida Hospital continues to excel in orthopedics. "We have a five-star rating from Health Grade for our orthopedics care," Cook says. "We were ranked number 23 out of 400-plus hospitals in the state by U.S. News & World Report. They look at service, quality and safety, and we score higher than most hospitals in much larger markets." South Florida State College, with campuses in Avon Park, Lake Placid and DeSoto, plays a critical role in preparing the work force of Florida Hospital, notes Cook. "They have developed a nursing program that is so successful that we can't even take all of their graduates," he says. "We get excellent workers in the fields of health care that we need. With the local college being recently upgraded, we are also getting the bachelor's degree workers that we need." Florida Hospital Heartland Medical Center employs 1,300 workers in Highlands County and is ranked the 23rd best hospital in the state out of more than 400 hospitals, according to U.S. News & World Report.